After seven hours of ascending a stone trail built hundreds of years ago by the Incas, you ascend the Monkey Steps and can sense you’re within reach. The day’s sun has been strong as you hike above the Urubamba River, but now you’re in cloud forest. A light rain induces a rainbow to cross the Andes and infuse the clouds with Peruvian pastels. It’s a harbinger of a more spectacular site ahead. The steps are so steep you use your hands like a monkey as much as your legs to gain the vista. You’re a little over 8,000 feet so altitude sickness is not a factor. Your senses are at full throttle when you arrive at Inti Punku or the Sun Gate, the original guard portal leading down into Machu Picchu. The terraces and stone buildings are a luminous green and grey set into a mountain majesty that still begs questions of how the Incas could have built this citadel in the 1400’s without wheels or iron tools. You drop your pack and try to take it all in. A photo doesn’t do it justice but there is cell phone connectivity here and perhaps you call home to share your first glimpse of Machu Picchu with loved ones. Machu Picchu is on the bucket list for seemingly everyone from China to California so it’s not easy finding a way that makes it feel as special as when Hiram Bingham rediscovered this mountain citadel in 1911. With over a million visitors a year, Machu Picchu, despite its remote location has been over-visited the last 15 years, requiring strict controls on tourism by park officials to save it. Tusker founding guide Eddie Frank has long pondered how best to do this trip and still satisfy his adventure seeking clientele. So he and South America guide, Andrew Springsteel did just that. By hiking to the site along the Inca Trail instead of taking the tour bus up from Aguas Calientes as 99 percent of tourists do, it is still possible to realize the magic that is Machu Picchu. Tusker’s new Peru itinerary, featuring Machu Picchu will debut May 4 and comprises a nine day trip primarily based in Cusco with one night spent at the base of Machu Picchu in Aguas Calientes. Tusker‘s groups are limited to 16 trekkers. After spending six days exploring the Incan sites in Cusco’s environs and hiking some high altitude trails above the former Incan capital, the trip concludes with the 15 kilometer hike to Machu Picchu. Tusker will offer this trip monthly from May to September, the dry season, and it will be led by Wilson Escalante, an experienced Peruvian guide who knows how to navigate the national park’s rules and traffic. The park allows 2,500 visitors daily so you want a guide who can avoid the peak flow and get your group the best possible views, hikes and historical intel about what you’re experiencing. Andrew Springsteel, Tusker’s South America guide says by arriving at the Sun Gate in the afternoon and descending into Machu Pichu later in the day when most of the tourists have departed, gives Tusker’s clients a better chance to experience Machu Picchu without the time limits placed on the groups who arrive in peak times. Tour groups are limited from three to five minutes during the peak hours at Machu Picchu’s iconic buildings that include Temple of the Condor and Temple of the Sun. “By arriving late in the afternoon there is great light for photography; and on the following morning we take the bus back up to the site at the earliest light. This also offers our trekkers great light and an uncrowded experience,” Andrew said. By the time the masses start arriving, Tusker’s travelers are on their way up Machu Picchu Mountain (10,007 feet) that towers over 2,000 feet above the citadel. This is a strenuous three-hour hike over ancient stone and astride sheer mountain drop-offs. While Machu Picchu has a 2,500 daily visitor limit, this hike is limited to 400, but is not fully subscribed because of its physical demands. Inca priests would make this climb to perform rituals on special dates in the Incan calendar, and when you summit and look down on the city and back at the wall of Andean grandeur, you too will have found religion. This will be the “softest” of all Tusker’s regular treks, in that it doesn’t require camping or multiple days of high elevation trekking in frigid conditions. The trip’s highest point comes on day 5 on a hike to Inca Pass at nearly 13,500 feet – but realize Cusco sits at just under 11,000 feet. Many travelers have made the mistake of arriving there from Lima at sea level and immediately hitting the streets to visit the colorful markets and ancient alleyways. They sometimes get altitude sickness because they didn’t properly acclimatize. Cool your jets for a few hours and adapt to Cusco’s thin air. It’s the most culturally immersive of Tusker’s offerings in that you will be visiting five major archaeology sites and museums to further increase your insight into the world of the Incas. That foundation will be important when you trek into Machu Picchu so you know why and how the Inca trail and Machu Picchu were built. The Incas were not just world class builders of roads and temples, but were ingenious in their design of irrigation systems. In their high mountain world they were able to craft cities on ridiculously steep slopes. You will gain insight into how they not just survived there, but how they conquered bigger more sophisticated civilizations. 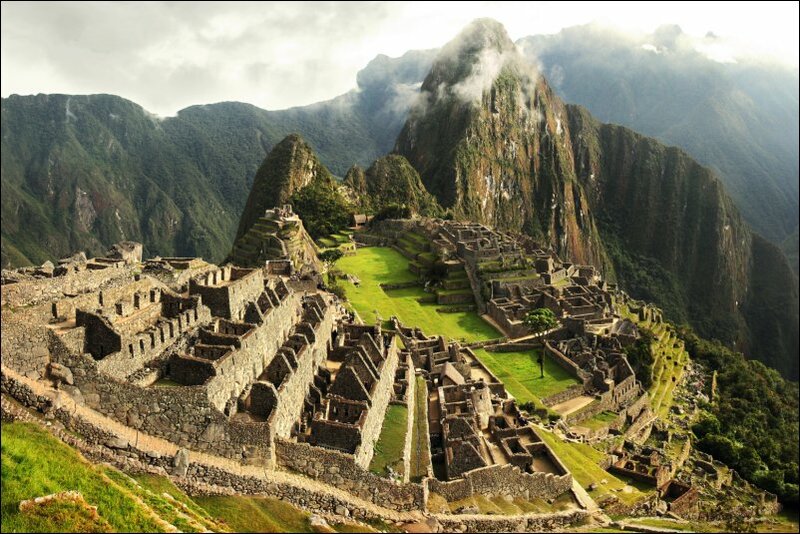 The trip’s highlight comes on days seven and eight spent at Machu Picchu and environs. Many independent trekkers who hire guides make a big mistake when doing the same route Tusker has chosen. Instead of getting on the first train out of Cusco at dawn they get on a 9 a.m. and never make it to the Sun Gate before the locks are closed. Don’t underestimate this trek; it requires every shred of daylight to fully embrace and complete it. Tusker’s clients are on the train before the sun is fully up and they get off at kilometer 104 after a 90-minute train ride. There is no train station here; you feel like you’re stepping out of the 21st century and being taken back to the 15th, when you hit the ground and start moving up the same route the Inca traveled. You carry the gear you will need for the next two days so pack smartly for a variety of weather conditions. The gradual uphill through and above the Urubamba River valley eventually climbs to perhaps the most spectacular of backcountry Incan small cities, Winay Wayna. It’s about three hours into the hike and the perfect place to stop, have lunch and fully embrace this overlooked Incan treasure. If it weren’t for Machu Picchu another four kilometers up/down the trail, Winay Wayna would be its own national park instead of being lost in the shadow of its seventh wonder of the world neighbor. When we camped here in the early 1990s we were all by ourselves waking to the sounds of the rushing stream next to the clean well-crafted trapezoidal architecture in the midst of abundant hanging gardens. Hummingbirds were everywhere feeding on flowering trees and shrubs. The terrain here is even steeper than at Machu Picchu and at 8,700 feet the highest point on your trek. Enjoy the homes, fountain and religious buildings as well as the magnificent staircases. Take it all in, but save some energy for the trail ahead. Once you pass through the Sun Gate, it’s a 45 minute downhill hike into Machu Picchu. Hiking there for your first visit gives you a far different perspective than the rank and file who arrive by bus that enters from below. As you hike into the citadel you will fully grasp why King Pachacuti chose this site for his royal retreat. After expanding and consolidating his empire by vanquishing his internal and external challengers he wanted a spectacular setting to host his relatives, the high priests and artisans who designed and built the citadel. It must have been both a spiritual and festive place for the royals. And it should be that and more for you as well. It is arguably the most spectacular ancient city left on the planet, yet it is still filled with mystery and awe despite its bucket list status. You have rewarded yourself for your life achievements and be proud of seeing it and hiking the trails of those powerful people who came long before you. Be also thankful to Pachacuti for sharing his dream and vision. It’s yours now.